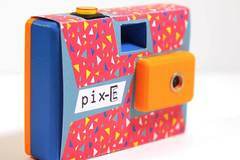 his is the PIX-E Gif Camera! My thought process was that I wanted to create a camera that recalled those days when disposable cameras were a thing. Anyone with intermediate making/printing/coding skills should be able to put this together pretty easily. Print out the three pieces and follow the instructions on Make Community Projects! https://community.makezine.com/share/nick-brewer/pix-e-gif-camera-323965 I've included the 123D Design file so feel free to modify the design to fit your needs.